The Red 5 X-Wing was Luke Skywalker's starfighter, the very X-Wing that destroyed the Death Star. The Original Red 5 filming model was incredibly painted, with lots of panels of different colors that somehow work together. It has been very difficult for me to try to imitate the color tones of each of these panels, as the very few pictures that exist from this models are lighted very differently, what sometimes hides or strengthens the color of a certain panel and the weathering and battle damage details. The weathering is very detailed but there is very little info on one of the sides of the fuselage so you are forced to improvise, what is a lot of fun. 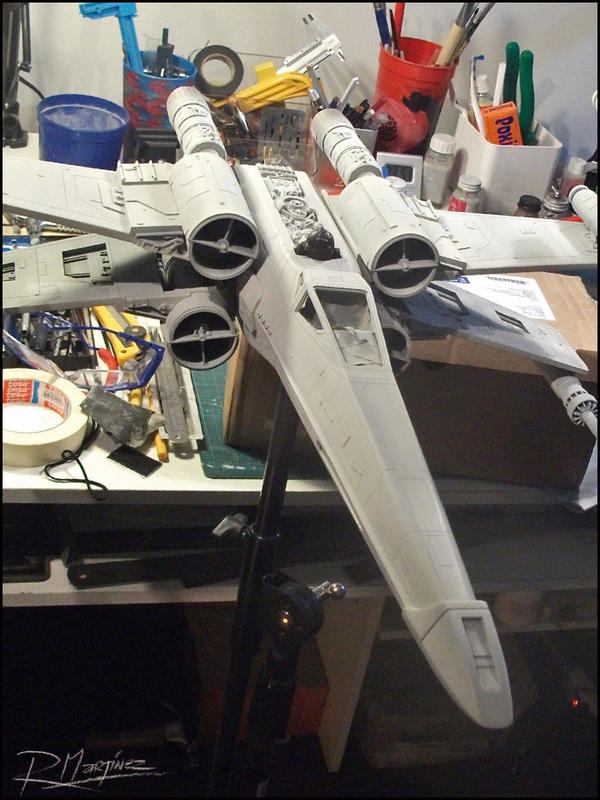 The Red 5 model was a "hero model" this is, a model that was painted in detail and had more features as it was meant to be filmed closely, all the opposite of a "Pyro Model", a model meant to be blown apart for battle scenes. Red 5 had a motorized aluminum armature that allowed the special effects technicians to open and close the wings if the takes required it. 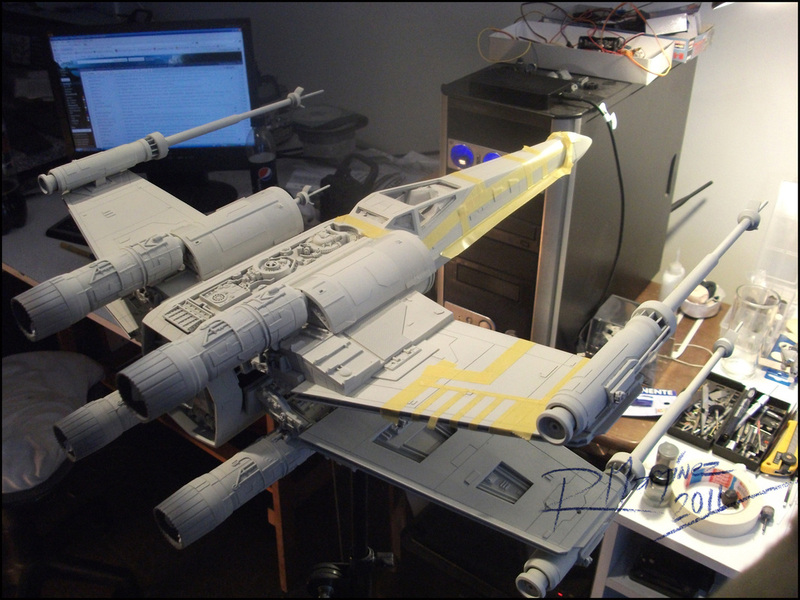 ILM Red 5 Original Filming Model. 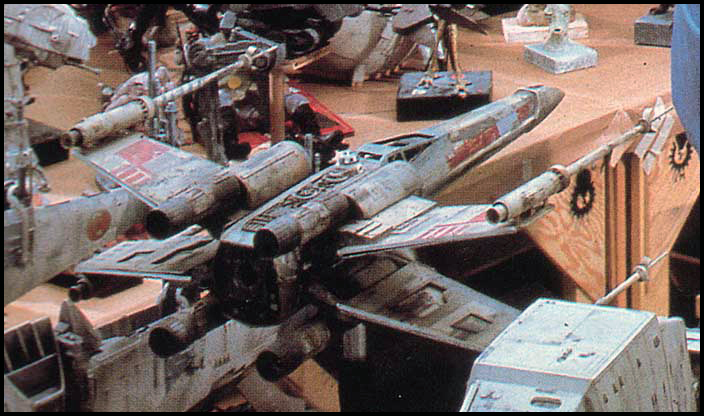 ILM Red 5 and Red 1 Filming Models - movie still. Sadly, we may not see new info on the Red 5 ILM Model, less of all of the fuselage, as all that it is left from the original filming model are the wings. 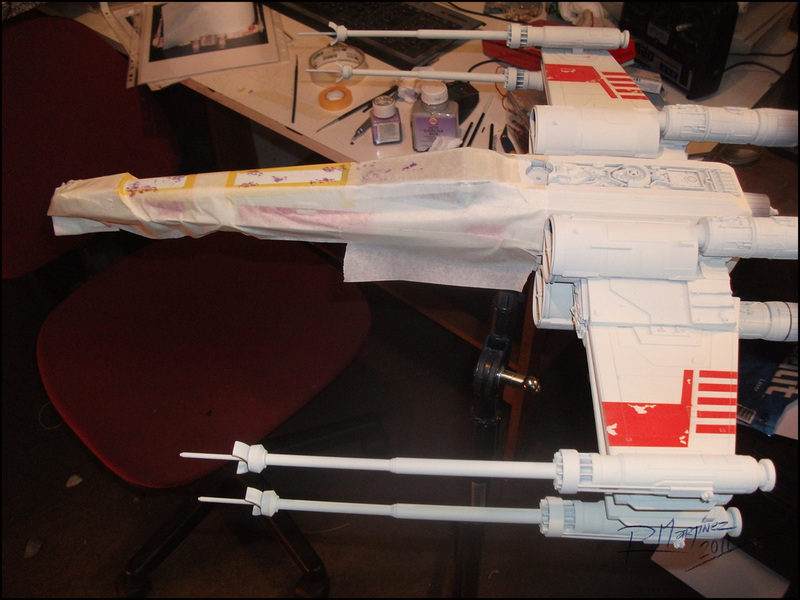 In the following gallery you will see pictures of the painting process of my Red 5 studio scale X-Wing. Painting a Red 5 X-Wing - First Steps. In the picture above, the model is painted with the base color described on the right, but the camera lens does not depict accurately the real color. You may see how much the base color varies in the three pictures. The first issue to solve when painting a Star Wars model is the base color. Is it white? is it grey?. The truth is that there is much debate between studio scale modelers on this subject, as mostly no one has been beside an original model. So we are left to interpret the color each one sees on the pictures he's got. *The rectangular colors samples in the chart are just a guide, as the colors may vary according to your monitor screen and color profile settings on your PC. 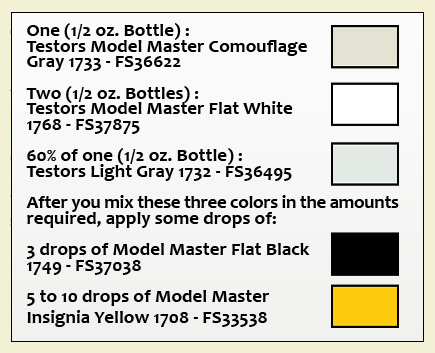 The FS number allows you to find the same color on another paint brand. Applying Maskool for damage effect on markings.